I would hate to say that a mere scone could result in fistacuffs, but it would be a lie to say that making these scones were easy-breezy. I’m a bit touchy when it comes to things I’m not completely sure about…things like making bread and pie crusts or recipes with excessively complex directions just turn me into a bowl of jelly and I get the freak-outs quite easily. Funny thing, I’ve made this recipe 3 times previously and found it to be wickedly simple to make and amazingly easy to eat. So what went wrong this morning? Maybe it was lack of coffee in my system or maybe I still had a bit of fighting spirit from last night’s Critical Mass bike ride. Whatever it was, the makings were a bit messy. My original plan with these scones was to add some frozen strawberries and some grated coconut to jazz these babies up. However, when I had Cornelius read the recipe from Molly‘s blog, he “forgot” to mention when to add the additions until it was too late. I had already added in the wet ingredients and was about to start kneading when I asked Cornelius, “when do I add the berries?” Oops! He claims that he did indeed tell me when to add the extras but I wasn’t paying attention*. A heated debate insued and it was finally decided that it would be best to keep the scones as is because I was afraid as to what might happen if I added in the extras too late in the game. What can I say, I’m a chicken through and through. Bruised and battered but still a team in this endeavour, we crossed our fingers and hoped for the best with our virgin scone recipe. The results? Simply amazing. I never thought that a plain scone would satisfy. It did, but I’d be lying to say that the addition of a schmear of butter and a dollop of drippy sour cherry jam didn’t make them closer to god. Divine, truely. 2. Mix the milk and the egg together until frothy and then set aside. In a large bowl, blend the flour, baking powder, and salt. Add the cubes of butter and blend the mixture through with your hands until it’s blended through and you have no lumps larger than a pea. Add the sugar and any flavour enhancements of your choice. Add the milk and egg mixture, reserving about a tablespoon as a glaze for later. 3. Turn dough out onto a clean counter and knead it no more than 12 times. Pat dough into a round approximately 1/2 an inch thick, and cut into 8 wedges. Place on an ungreased baking sheet or a Silpat. Using a pastry brush, glaze wedges with remaining egg/milk mixture. Bake for 10-15 minutes, or until golden. Cool on a wire rack. * Hmmm, was I paying attention? I’m not telling. Yum! I love it when the simplest concepts result in delicious snacks! Think I’ll be making scones soon, too…. Thanks Jenna! And I’ve emailed you with my answers. I completely agree, Rorie. Simple is best! Tania, I’ve always wanted to try chestnut jam! It looks so tasty and chocolately in the jars, but I’m not quite sure what it would taste like. Now, you’ve given me some inspiration! 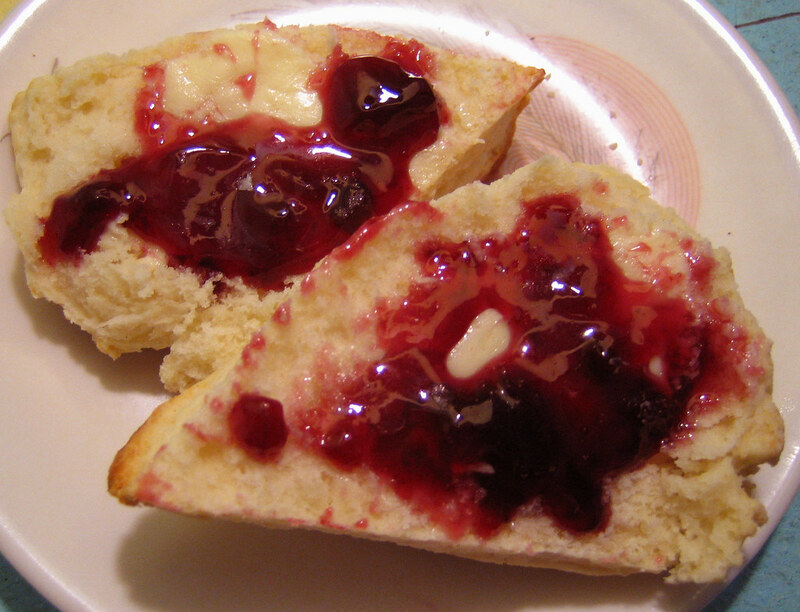 I am wildly crazy about scones– thanks for the fun post and recipe! Daramay, I share your affliction! Tried this recipe out today . . . absolutely fabulous! I hope it’s okay to post it on my blog with a link to you of course! Hello Adventurous, of course you may post this recipe! I just tried a hand at baking up a batch of these babies and they turned out fantastic! I’ve had trouble with scones before, I have no idea, but this turned out really well and it was really simple to make them too. I added a banana to the mix and midway baking in the oven the smell just wafted deliciously into the air. I couldn’t wait to pop one of them into my mouth when they were ready! Will definitely try it again with a variety of fruits and flavours next time. Have you ever tried to use buttermilk instead of milk in this recipe? lulu, i rarely have buttermilk on hand, so i haven’t tried it out, but i’m sure it would be lovely! I wasn’t sure where to post this comment, but I found your blog when looking for a recipe. Your food blog reminds me of another that I visit every day. Chk. out http://www.smittenkitchen.com. I bet you’ll also be hooked. lulu, i’ve got smitten kitchen on my blogroll…it’s a great site. 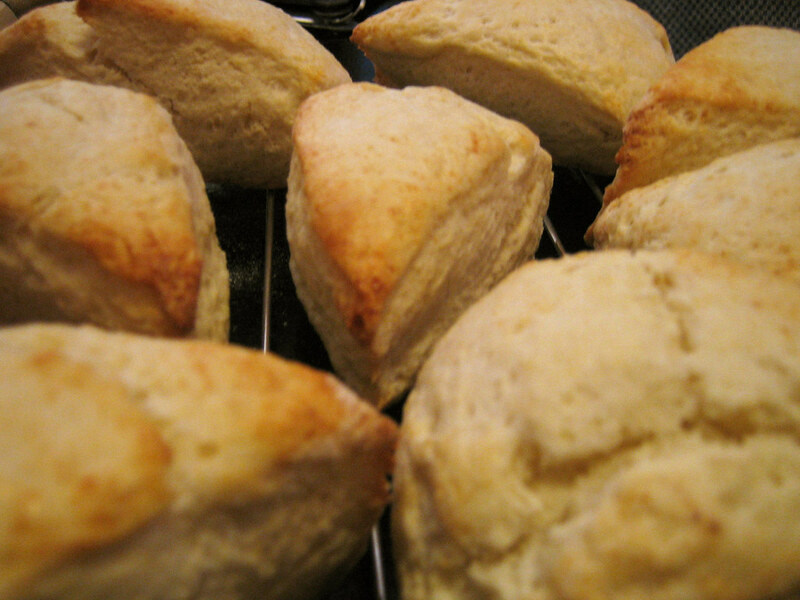 as for milk, i use skim milk in my scones and they always turn out great. these scones aren’t light and fluffy tho, but more dense and flakey. it’s true that adding berries does make a much wetter dough, i’ve made a blackberry version (in my archives) and despite all the wetness, they still turned out really well. michelle, glad i could help out!